Oh, you're stupid, you are. - I thought you were going to tell us a story. I am. It's about a girl and her baby brother. - Oh, a baby! I love babies! Do we get him? Do we? Do we? You'll have to wait and hear the story. - Oooh, I love it when we get the baby! And becoming one of us. - Was I a baby once, too? You were ... as I recall, a particularly ugly one. - Not as ugly as me! Well, do you want to hear the story or not? - Oooh, yes! Tell it, please! The book: A novelization of a screenplay by Terry Jones, based on a story by Jim Henson and Dennis Lee. Mostly it's just lots of photos. The film: Jim Henson demonstrates that when he strayed too far from the Muppets, he tended to lose his way. It's like a cross between the quest theme of The Wizard of Oz and a more raucous version of a Disney fairy tale, but it's not as good as that sounds. 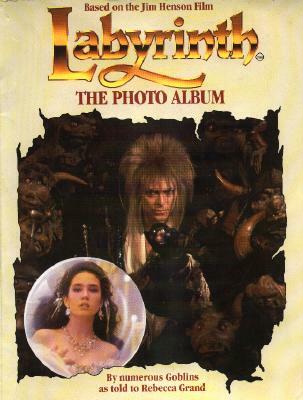 The role: Bowie (typecast yet again) is The Goblin King and, if you're eight-years-old, he's probably quite convincing. The wig's certainly scary. Most memorable image: Bowie wearing an absurd pair of tights and an even more absurd wig.